With front-wheel drive being so common these days, the differential is also being taken care of during a transmission service at Express Car Care, so most Denver drivers don’t even have to think about it. And most rear-wheel drive differentials don’t need to be serviced for many miles, so it’s understandable why it’s not something on the top of drivers minds. Because of this, it’s not uncommon for people not to know they have a differential, let alone know that it needs service. To understand better what a differential does, think about a high school track. 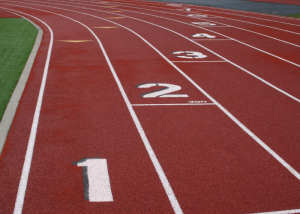 There are lanes marked on the track. For the long distance races, the starting lines are staggered. The starting lines for the outside lanes are ahead of the starting lines for the inside lanes. That’s to compensate for the longer length of the outside lanes. Staggering the starting lines means that each runner has the same distance to run. Differentials do a lot of work and require very heavy duty parts, and those parts need protection. The differential fluid lubricates the gears in the differential and keeps them cool. The fluid eventually gets dirty and worn down. Some kinds of differentials require special additives that break down over time. So follow recommended intervals for replacing your differential fluid. Your helpful and knowledgeable pro at Express Car Care will drain the used fluid and check it out for metal bits, which could be a sign of excessive wear on the gears. He’ll then replace the fluid and install the additives if necessary. Four wheel drive vehicles need special attention to their differentials because they have a differential on both the front and rear axles that work at different times and sometimes under heavy loads – so they may need to be serviced at different intervals. Your service adviser can look up the recommended service interval or you can check your owner’s manual.